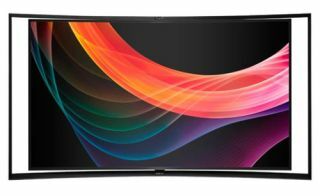 Samsung's first curved OLED TV goes on sale in the UK | What Hi-Fi? Samsung's first curved OLED TV goes on sale in the UK today, September 5th. It is available now in John Lewis and the Samsung Brand Store, with a price tag of £6,999. The Samsung S9C has multi-view capability meaning two people can watch different full-screen, Full HD content, even in 3D, on the same screen using Samsung's active 3D glasses. The self-emitting RGB sub-pixels are laid directly on the colour display panel, so no colour filter is required. As you'd expect on a flagship TV, you get the full suite of smart TV functionality through Samsung's Smart Hub. And the built-in S-recommendation feature recommends content based on the owner's viewing habits. And you needn't worry about the ste becoming obsolete: it's compatible with Samsung's Evolution Kit so can be upgraded as new features become available. LG was the first to bring its curved OLED TV, the 55in LG 55EA9800, to the UK earlier this year.